Next Meeting: Wednesday, July 10 2013, 6:30 p.m. – 8:30 p.m.
Join us in July when book artist, printmaker, and installation artist Erin Sweeney presents her work and practice, which currently explores, among other themes, the notion of home. Her studio, Lovely In The Home Press, is in Peterborough, NH, the town that playwright Thornton Wilder used as inspiration for his Grover’s Corners in the play Our Town. Erin has a love/hate relationship with her small town, as many people do, and much of her work is centered around this relationship. In addition to sharing her inspiring work, Erin will lead us in a hands-on exploration of the magic of one-sheet folded books, demonstrating how they can be used as building blocks to make sculptural work, tell longer stories, and bring your viewer into your pieces in unexpected ways. The opening reception for the Book Arts Guild of Vermont show, There’s No Place Like Home, was an exciting and inspiring evening. The gallery was abuzz with members of the guild as well as interested observers, enjoying our show as well as the wonderful show, Tell us a Tale, in the main galleries at Studio Place Arts in Barre. We shared details about the construction, materials, problems, and surprising outcomes of our pieces with the appreciative audience, enjoyed some great snacks, and connected with old and new friends. The show, set up by Sue Higby of SPA, looked amazing and filled the gallery with energy. Thanks to all the artists who participated- what a talented group we are. And thanks to SPA for hosting the show. Our exhibit is open now through July 6, 2013. You can view images from the exhibit and the opening on the B.A.G. blog. Here is a great opportunity to help represent the Book Arts Guild of Vermont and participate in the Art Hop at the same time – join us in a group table at the Art Hop Artist Market Extravaganza on September 7, 2013! Participation is limited to the first 10 members responding by August 1st. Please be aware that you must agree to our guidelines before committing to participation – please download the Art Hop exhibition sheet and review the terms before agreeing to participate. *** Congrats to B.A.G. member Carolyn Shattuck for her recent feature on the Center for Book Arts blog. CBA intern Kate Burns had the opportunity to visit Carolyn during this spring’s Open Studio Weekend. Carolyn spoke about her bookmaking and printing processes as well as her inspirations while allowing Kate and her father, Dave, who was visiting the east coast from Montana, to nose around her workspace and take some pictures. *** B.A.G. member Nancy Stone will exhibit her handmade books in the exhibit Drawn to Music. Nancy’s work will include Line Notes, a window installation of seven translucent accordion books traced from her sketches of performing musicians; Vibrations, a suite of six triptych-books of watercolor paintings developed from Line Notes; and Ecclesiastes III, a suite of diverse pop-up, white-on-white books based on “A time for war; a time for peace”, etc. The show runs from June 4, 2013 – August 29, 2013 at the Cathedral Church of St. Paul in Burlington, VT. The opening is on Friday June 7, 2013 from 5:00 p.m. – 8:00 p.m. with an artists’ talk at 6:30 p.m. Summer hours are Tuesday – Friday, 9:30 a.m. – 4:30 pm. Jazz, folk and classical musical events will correlate with the exhibit. *** B.A.G. member Elissa Campbell is teaching Book Arts Open Studio, at Studio Place Arts in Barre, VT on July 8, 15, & 22, 2013 from 4:30 p.m. – 7:30 p.m. In this 3-part workshop, the use of both standard and unconventional materials will be demonstrated, along with creative ways to apply them to the book arts. A wide range of tools and materials will be available for you to try, including collage, carved block stamps, image transfer, Dremel, and paper cutting. Different binding techniques will also be explored. To register, contact SPA via phone (802) 479-7069 or Email. *** Elizabeth Rideout‘s workshop Bookbinding Intensive: Simplified Binding With Leather Relief Cover, scheduled for June 22 – 23, 2013, has been postponed until further notice. We will let you know when the workshop has been rescheduled. *** The New England Chapter of the Guild of Book Workers members Stacie Dolin and Amy Lapidow’s book, Book Art Studio Handbook: Techniques and Methods for Binding Books, Creating Albums, Making Boxes and Enclosures, and More provides the inspiration or the text block for an online exhibition now available for viewing. The exhibit features the work of 12 NEGBW members, including McKey Berkman, Brittany Fay, Samuel Feinstein, Karen Hanmer, Barbara Hebard & students, Dana Kull, Amy Lapidow, Anne McLain, John Nove, Todd Pattison, and Janine Wong. 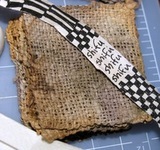 *** On August 9-11, 2013, Velma Bolyard will teach the traditional Japanese art of shifu, a spun and woven paper textile, both a quiet and meditative art at Long Ridge Farm in Westmoreland, NH. You’ll learn all aspects of the process, from paper to finished small weavings. Beginning with a large sheet of lokta or kozo paper the process moves through preparing and spinning paper into thread or yarn, wet or dry for comparison, to ultimately weaving the threads on a simple loom that each student creates from repurposed materials. During free moments, a bouquet of simple book structures will be taught, one of which can showcase each student’s workshop samples and thoughts. For more information or to register, please visit the Long Ridge Farm website. Registration for 2014 opened on June 15, 2013. Spirit House – A Three Dimensional Pop-Up Model: In this workshop, you will make a 3D pop-up spirit house from paper. There are no folds – the whole structure (comprising over thirty separate parts) is made from hinges and dovetails joints and will fold down flat. Book as Architecture: In this workshop, you will make a pop-up gazebo in which there are no folds and therefore no paper ‘fatigue’. All sections are fastened together using a range of paper hinges, locks, and dovetail joints. Sections can be modified and redesigned as the model develops – you simply take out one section and replace it with another. For more information, please download the registration form(s) below or contact Todd Pattison via Email: bookandtile@att.net. *** Richard Horton is teaching Handmade Photo Album Structures and Strategies on July 27 – 28, 2013 at White Square Books in Easthampton, MA. The purpose of the workshop is to teach you to design albums that are beautiful, safe for real photos, and easy to look through, with pages that lie flat. You will take with you from the course a finished model of a 10-leaf album with its paper cover and box. You will take a small stiff-leaved sewed codex, and you’ll take at least 2 large leaf models demonstrating multiple mounts on both sides of the page. For an expanded course description and list of what to bring, please contact Richard at albumsandsuch@gmail.com. *** Daniel Kelm is offering The Leather Intensive at his studio, The Wide Awake Garage, in Easthampton, MA from July 21 – 26, 2013. During this six-day intensive each participant will produce a full-leather binding using techniques traditional to English and French construction. Variations in structure and the characteristics of materials will be discussed extensively. Endsheet configuration, text sewing, rounding and backing, hand-sewn endbanding, spine lining, leather paring (both with knife and manual paring machine), covering, and leather joint application will be explored. *** Bill Hanscom is teaching Album Structures at the Simmons Graduate School of Library and Information Science in Boston on Saturday, June 29, 2013 from 9:00 a.m. – 5:00 p.m. In this workshop you will explore the construction and mechanics of a variety of album structures from the traditional to the intriguingly unconventional. You will learn several structures, including a Simple Board Book Album, the Storage Book, Pocket Album, Spider Book, Multi-leaf Accordion, and an Accordion Album. For more information or to register, please visit the Simmons GSLIS website.